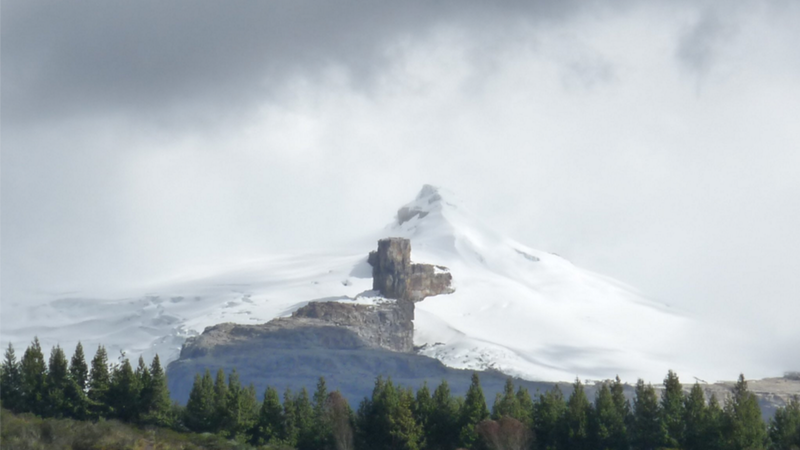 EL COCUY, Colombia— The snowcapped mountains gleam in the sun like a birthday cake dripping with thick white frosting. As I contemplate the scenery, a group of U’wa indigenous people and campesinos next to me discuss how they're going to track down two tourists who apparently slipped past them into the mountain reserve earlier that day. “I think they went up that way,” says Oswaldo Tamaran, a member of the U’wa indigenous guard, pointing towards a trail that skirts a silver-plated lake. “If they went up that far, we’ll only be able to catch them when they come back down,” replies one of his campesino comrades. El Cocuy National Park used to be known among travelers as one of South America’s most beautiful hiking spots, ridged with a dozen snowcapped peaks, unique rock formations, and high-altitude trails that can keep hikers and mountaineers exploring for days. But local activists have recently shut down the park to outsiders and are threatening to never let them return. The dramatic action, which occurred three weeks ago, was taken after a group of mountaineers played a soccer game on one of the park's fragile glaciers. “We don't want tourists here,” said Audon Meneses, another indigenous guard, after he turned away a disappointed Israeli backpacker who was hoping to hike into the park. The soccer stunt occurred in February, when eight mountaineers kicked a ball around on a glacier 15,000 feet above sea level while wearing their crampons for cleats. Adding insult to injury, the group filmed the soccer game and posted it to YouTube for the world to see their antics. The self-styled soccer stars said their glacial game was part of an attempt to raise funds for a foundation that helps people with disabilities. They later apologized for the stunt. But for campesino organizations, the high-altitude soccer demo was the latest example of how tourism has run amuck in the park. That's why some 60 campesinos and indigenous people from the nearby U’wa reservation are peacefully occupying the park, blocking all three entrances and patrolling the area to catch any tourists who try to sneak past their checkpoints. “I was very outraged by the video…this is the home of our god, Sira, [the creator of all things]” said Aura Tegria, a spokeswoman for the U’wa tribe. Campesinos who live near the national park say that they have a long list of grievances that Colombia’s national parks service hasn’t addressed. One of their main complaints is that tourists have polluted local water sources by defecating near streams that feed into local aqueducts. Like many of the world’s tropical glaciers, El Cocuy has been hit hard by climate change, losing about 90% of its ice-cover over the past 150 years. The campesinos and U’wa argue that tourism on the mountain is making the bad situation worse. But not everyone is happy with the park's closure. Mountaineers who regularly visit the park argue that shutting down El Cocuy is an excessive measure that infringes upon people’s right to enjoy Colombia’s natural areas. A tourist camps by one of El Cocuy's peaks. Photo taken in 2011. Federico Kircher, an amateur mountaineer and international aid worker who’s been visiting the park since the 1990s, says that that there’s no science to back the claim that hiking on the glacier makes it melt faster. He said that problems like defecation along water sources could be solved with better infrastructure in the park. “There are places there that can get up to 300 visitors per day, but only have three bathrooms,” Kircher said. El Cocuy gets around 20,000 visitors per year, which is a relatively small number compared to other trekking destinations in the Andes mountains. A mountaineer makes his way towards El Castillo, one of El Cocuy's tougher climbs. Kircher said that he’s never seen more than 10 people on El Cocuy’s summits at any one time, a fraction of the people found climbing more popular summits such as the Cotopaxi Volcano in Ecuador. But protesters say they don’t want to take any chances with the “dying” mountain range. Many of the campesinos I spoke with argued that the benefits of eco-tourism aren’t going to locals anyway, but to companies from Bogota that bring tourists on vacation packages and manage log cabins near the entrance to the park. In Guican, the town closest to the national park limits, some local businesses and mountain guides, said they were benefiting from the park and hope that it can reopen in a way that's less polluting and more economically beneficial to the community. But for now, the self-appointed defenders blocking the entrances to El Cocuy aren’t budging. They insist they won’t lift their roadblocks until the government agrees to permanently shut down the park to tourism.